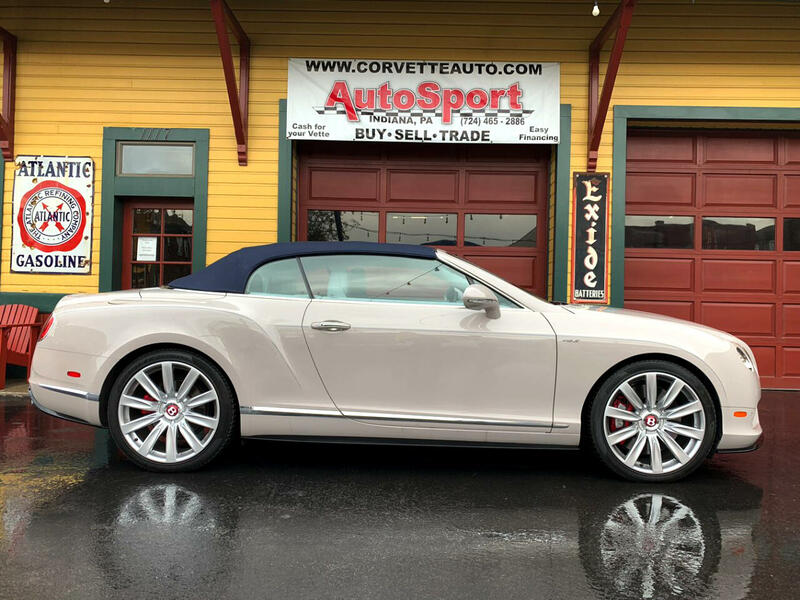 Used 2015 Bentley Continental GT V8 S Sold in Indiana PA 15701 AutoSport Co.
For sale is a stunning single owner Dove Grey, Breeze interior w a Blue Convertible Soft Top Bentley Continental GT V8 S w/ 7k miles!! This car has a window sticker price of $236,120! It is loaded from the factory! The Dove Grey paint is an option upgrade that sets this car apart from most Bentley’s you see on the road. The Breeze leather interior has a light blue tint to it with a dark blue dash and center console to match the soft top. It sits on 21’ propeller wheels that is another upgraded option. Under the hood is a Twin Turbo 4.0 Liter V8 engine pumping out 521 hp @ 6000 rpms and 502 lb ft of torque @ 1700 rpm!! This is impressive power and it feels like your in a jet airplane taking off! It has an 8 speed automatic transmission. This car offers some beautiful standard and added features like the Breitling dash clock, vented massage front seats, deep pile over mats front and rear, knurled gear shifter, piano black veneer fascia panels and console, black matrix grille, permanent all wheel drive system, and much more! This is truly an impressive automobile and you must see it in person to truly appreciate the color combinations on this amazing Bentley. If you are looking to be the best without spending the most give us a call at 814-977-9219 or email us! Thank you for looking! Message: Thought you might be interested in this 2015 Bentley Continental GT V8 S.